1. Are AERODEFENDER™ Wheel Fairings legal for UCI competition? However, many popular semi-competitive events, such as Gran Fondos and Triathlons, do not have strict rules on equipment. In any case, without this critical shielding of the upper wheels, bicycles are needlessly aerodynamically inefficient, especially when facing any modest headwind. So those who still want to win these amateur competitive events, will soon be choosing AERODEFENDER™. 2. How effective are AERODEFENDER™ Wheel Fairings under null wind conditions? Expect smaller gains in either null headwind or tailwind conditions (unless going quite fast downhill), depending more on the vehicle speed. But expect aero gains to increase dramatically as headwinds rise. The gains are immediately noticeable, since gains increase very quickly when facing even light headwinds. Gains in speed rise rapidly facing light headwinds. At 10 mph while facing a 15 mph external headwind, most cyclists will likely gain more than 1 mph. The acute dependence on external headwind speed is due to the extreme sensitivity between power dissipation in drag and the effective wind velocity on the upper wheel, being a cubic relation. Just a slight rise in headwind speed on the fast-moving upper wheel then causes a relatively large jump in actual power being dissipated in drag on the wheel. As the effective windspeed rises to exceed twice the vehicle speed while facing external headwinds, power dissipation then rises quite rapidly on the upper wheel, much faster than on either the bike frame or rider. 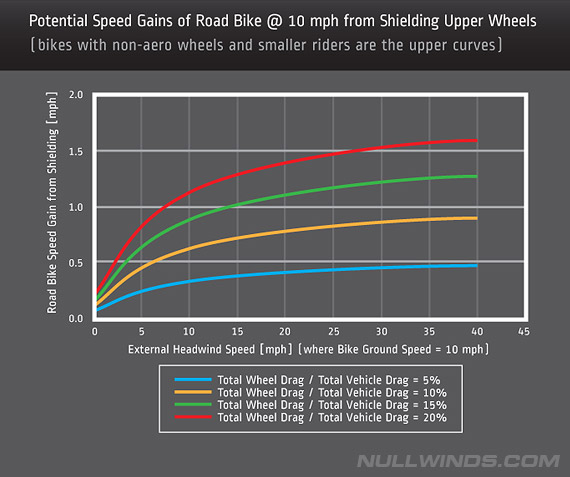 This is why it is so difficult to accelerate against headwinds; the upper wheel is being accelerated much more rapidly (up to a factor of two) than the bike itself, greatly increasing the power being dissipated thereon with only a slight increase in vehicle speed. It feels much like pushing against a wall. Enthusiasts should note that faster riders will gain the most benefit, as they dissipate a greater portion of the total dissipated system power on the otherwise exposed upper wheels. So unless you mostly ride slower under null wind conditions, the fairings will dramatically enhance your overall aerodynamic efficiency. You will become effectively much faster, especially while cycling in windy conditions. 3. Why do AERODEFENDER™ Wheel Fairings increase cornering traction? 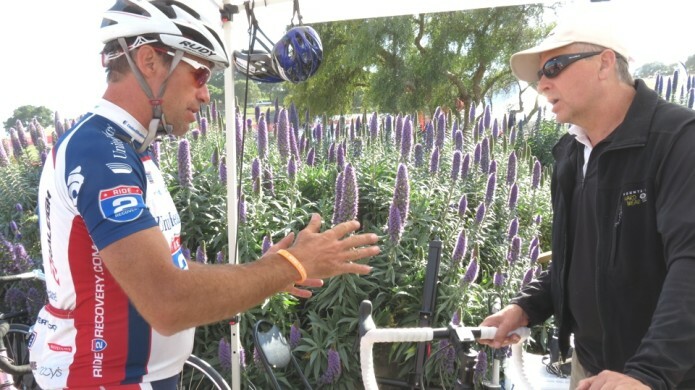 Robert Keating explaining surprising enhanced stability while first testing at Sea Otter Classic Bike Festival, 2013. Because shielding the upper wheel reduces the countertorque induced on the wheel at higher speeds — which in turn produces a ground slip reaction force at the contact patch — the reduced ground slip force then causes the total lateral traction available for cornering grip to increase substantially. As a result, cyclists report that the bike feels noticeably heavier than usual at speed. It is not actually heavier, but simply has more cornering traction. 4. Have you tested inside a wind tunnel? In our superior method, power dissipated in drag is directly measured through the wheels, rather than the indirect measure of only translational drag forces on the frame. Traditional methods simply measure longitudinal drag forces projected directly onto the frame, without considering how upper wheel drag forces are actually magnified against the frame. Measuring forces alone to infer vehicle efficiency must then rely on engineering assumptions, which fail to account for vertical-motion wheel drag, which then goes largely unmeasured. 5. How many watts are saved? Another misleading question from industry marketing efforts. Since traditional frame geometry streamlining optimization as well as wheel geometry optimization efforts produce comparatively little relative performance differences, industry has resorted to counting individual watts in order offer differentiation over competitors products. And since so many variables actually affect the relative performance (vehicle speed, headwind, crosswind, rider size and position, etc.) has led to confusion in providing any accurate comparison. AERODEFENDER™ wheel fairings simply provide unmatched performance boost over any of the aforementioned traditional approaches to vehicle drag reduction. You will save many, many watts, especially at higher speeds. Is that enough? 6. Why is this invention not yet employed in Formula One? Wow. We have wondered this for years, since an upper deflector will boost both speed and lateral traction, thereby enhancing safety as well. And finally we got the answer at Interbike 2018, where we ran into two top Forumla One aerodynamicists from the U.K. They explained that they were principally concerned with high drag and lift forces developed at the bottom of the wheel. While lift forces are an issue to overcome, there is nearly no actual effective vehicle drag induced near the nearly stationary bottom of the wheel, as taught by our various inventions. And the front wing deployed low while attempting to increase traction, actually simultaneously causes a loss of front wheel traction by increasing the aerodynamic pressure on the upper wheel. They simply did not believe this to be true, and explained that if true, it certainly would have been considered before! Apparently not.